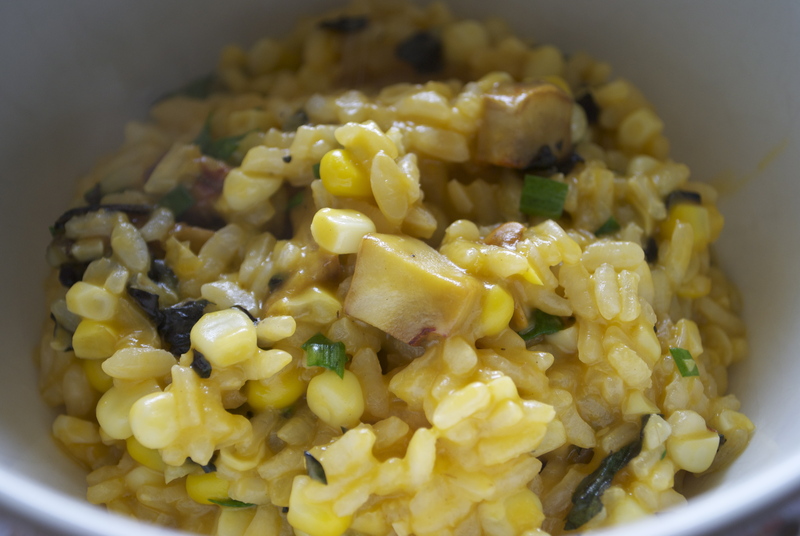 Lobster Mushroom & Corn Risotto. Last week I needed some rutabagas for a recipe I wanted to make. I was a little surprised that I couldn’t find them ANYWHERE. I couldn’t find any at the farmer’s market, Whole Foods, 2 other grocery stores….They are supposed to be in season now, so I was confused and didn’t know where else to look. Then, the internet suggested Jons. Ahhh….Jons…..how could I forget about Jons? Turns out Jons has a surprisingly amazing produce section with a lot of extremely cool items. They have key limes, they had parsley root, they had all kinds of things. They had rutabagas (finally!!!) and then I saw some purple basil. Man, purple basil at Jons in October. I never would have guessed. Heat 11/2 tbsp Earthy B in a medium sized saucepan. Add lobster mushrooms and sauté over medium heat until the mushrooms are soft and have released some of their liquid. Remove from heat and set aside. I usually make risotto with my stock at room temp rather than heating it because I hate making another pan dirty just for stock. BUT, to make risotto the right way, go ahead and add your stock to a saucepan and put it over a low flame to keep it nice and warm. Heat remaining Earthy B in a large pot or dutch oven. Add the shallots and garlic and sauté for a couple of minutes. Add the corn and the rice and toast for a few minutes until the edges of the rice begin to look translucent. Your rice should have a white dot in the middle—then add the wine. Stir until all of the liquid is absorbed. Now start adding your stock, one cupful or ladleful at a time. Stir after each addition, until all the liquid is absorbed, but make sure you don’t let your risotto become dry and just remember to keep stirring. You should continue this process until you have used up all of the stock. Before you remove the risotto from the heat, add the lobster mushrooms and mix them in. Cook for another few minutes until mushrooms are warmed through (if they got cold). Add optional Daiya at this point and stir to incorporate. Remove from heat. Add fresh herbs and serve. I have no idea where one might find lobster mushrooms around here but I’m on a mission to find them so that I can make this risotto! Yum! They’re not cheap, but definitely worth it to plan a few dishes around them to try them if you’re a mushroom fan. If for any reason you can’t finish them, you can always dehydrate them and save them for another time. They lose a bit of their charm when dried, but still good. They make an excellent replacement for lobster on a lobster roll too—there’s a recipe for vegan lobster rolls floating around on this blog somewhere! I’ve never heard of lobster mushrooms! your risotto looks fab, I am a massive fan of sweetcorn. Purple basil? Such a thing exists? I wish we had a Jons by us, I could go for some awesome produce right about now.That fancy risotto looks super yum! Thank you! Purple basil is the best! It tastes and smells just like green basil, but it’s purple which makes it badical. Purple pesto is awesome. 🙂 I was actually a little shocked to find such a vast variety of treats at Jons. They had kohlrabi too, which I rarely see–And I thought the parsley roots were parsnips, but then the produce guy explained to me how they look similar but are entirely different things. Thanks Jons! That is one lovely lobster (mushroom) risotto. Thanks for sharing your recipe.